A New Jersey Teachers Union official tries to apologize to Governor Chris Christie for sending out an email advising New Jersey teachers to pray. Imagine that! A Union official telling teachers to pray to God. What were they told to pray for? Higher pay, more vacations, better health benefits? Oh Lordy, Lord NO! The Teachers Union told its members to pray for the DEATH of Governor Christie. This is Governor Christie’s response and shows why he is such a great leader. “Borking” & “High Tech Lynchings” have been put on hold just in case a Republican is ever again nominated. Today there is a “Sotomayor LOVE FEST” in Washington DC! What a difference there is between the treatment of a Republican President’s Supreme Court nominee and that of a Democrat President. This current President, Barack Obama, voted every single court nominee that came before him as a Senator, as UNQUALIFED to serve! He even said that Chief Justice John Roberts should not serve on the court. Yet now, his nominee, Sonia Sotomayor must be treated with much more respect, for she is GOOD! Viva La Difference? From London come these most interesting photographs of Malia Obama and her family’s political fashion statement. Pre-teen Malia was accompanying her father, the American President, in Europe. Why does the American media refuse to publish photographs of the Obama trip to Europe that America’s taxpayers are paying for? What was the message that the Obama family was sending to America and the world by having their daughter wear the American anti-war symbol on the very day that her father was shooting missiles into Afghanistan and Pakistan, killing scores of people? Is the Obama family protesting America’s war policy? If so, why not tell the Commander-in-chief to just STOP IT? Or was Malia a walking poster child for the Campaign for Nuclear Disarmament? No one believes this t-shirt to be just an inadvertent wardrobe malfunction with Malia choosing a peacenik, anti-nuke logo instead of a smiley face or pink flower. Oh no! This European trip was an “official” state visit by the White House entourage, which apparently even included American celebrities. Official state visits are always very well planned in advance, particularly the family’s public wardrobe. 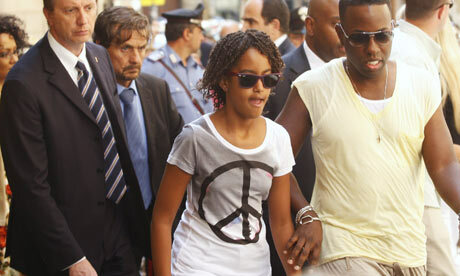 Even if one does not find the message of the t-shirt to be interesting of itself, what about the appearance of the President’s daughter being abducted by P-Diddy while the Secret Service looks on? Should not that merit a mention by America’s media? Here we see P-Diddy (at least that’s who I think he is) trying to kidnap Malia Obama while one Secret Service bodyguard looks away, another looks bemused, and a third looks like he’s either drunk or totally contemptuous of the entire scene. Meanwhile, the fourth Malia bodyguard is moonwalking his way out of the scene, while an Italian police officer is concentrating on nabbing a pickpocket. Who knows what else we would find in this photograph if we could see the rest of the characters. Perhaps everyone following the Malia parade was wearing a “Death to America” t-shirt. Believe it or not, but later on Malia Obama removed the Peacenik T-shirt to reveal underneath … ta da … another Peacenik T-shirt in a different color. At least it was not a logo of Che Guerrero. 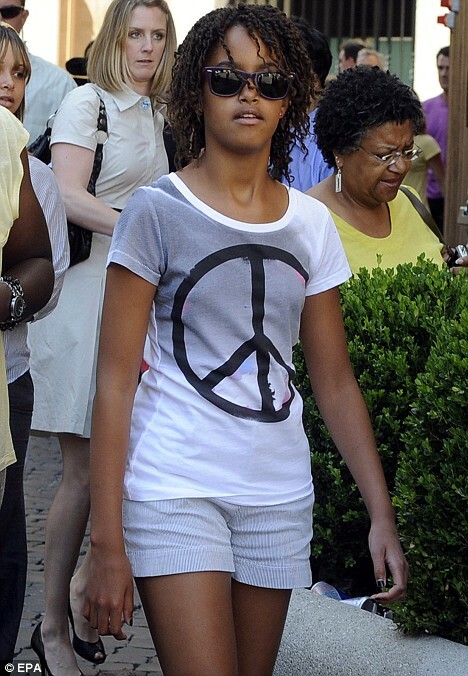 Malia Obama in a T-shirt bearing the Campaign for Nuclear Disarmament symbol in Rome ahead of the G8 summit: The Picture. Don’t look for this story at any “MSM” site or news outlet. It can only be found in English in the British Press. The America Press is afraid the Obama administration will punish them if they print the photograph. Don’t think for one moment that David Letterman and his ilk will mention this photograph during their comedy routines that pass for News in America of today. They are all too occupied slandering the children of Sarah Palin. I spotted this luxury BMW 760 LI with the flashy chrome spinners and “Chicago Boyz” plate holder on Shirley Highway during rush hour, heading out of Washington DC to Virginia. I couldn’t help but wondering if the Chicago Boyz Obama driver of this Beamer is one of those new Obama Car Czars who do not own nor drive American cars, yet have been appointed to oversee the American Car Industry. 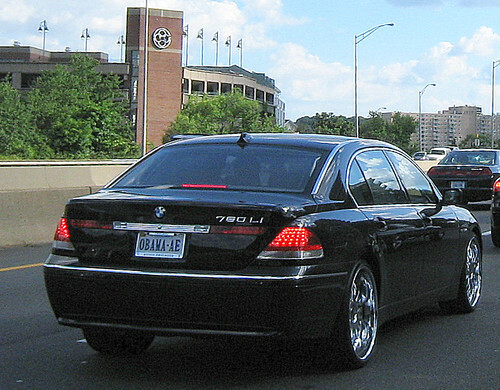 The image, Obama BMW 760 LI, is subject to copyright by barneykin. It is posted here with permission via the Flickr API by barneykin. You are currently browsing the archives for the liberalism category.